Have you ever wondered how sea lamprey populations are controlled? How is one species - a species responsible for the near-destruction of the Great Lakes fishery - singled-out from all the others? How are the bad guys targeted, yet all the good guys remain unharmed? 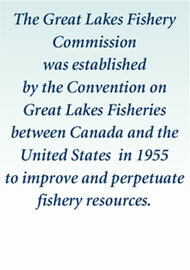 The Great Lakes Fishery Commission and its partners maintain an "integrated" sea lamprey control program that combines several control methods to attack sea lampreys, including lampricides, barriers, and traps. Since the early 1960s, lampricides have been the primary method of sea lamprey control in the Great Lakes basin and are essential to ensure the protection of the $7 billion fishery. Over 200 Great Lakes tributaries are regularly treated with lampricides, chemical compounds that effectively kill sea lamprey larvae without significant harm to surrounding plants or animals. Watch the video below for a comprehensive view of a large-scale lampricide treatment, a central tool in the Commission's Sea Lamprey Control Program. There are two basic lampricide chemicals: TFM and niclosamide. TFM is more widely used and acts physiologically to disrupt energy metabolism in larval sea lampreys. Compared to other fish, sea lampreys have low levels of the enzymes used to eliminate TFM from their bodies, which eventually leads to their death. During some treatments, TFM is combined with less-expensive liquid or powdered forms of niclosamide, thereby reducing the amount of TFM needed while still maintaining treatment effectiveness. Description: Sea lamprey control agents treat the Rifle River near West Branch, Michigan. The control program targets invasive larval sea lamprey before they have a chance to prey on Great Lakes fish. These lampricides are registered as restricted use pesticides with the U.S. EPA and Health Canada Pest Management Regulatory Agency. This registration means only certified pesticide applicators, or, control agents, may apply lampricides and that they pose no unreasonable risk to humans or the environment at the concentrations applied. The Commission must reregister the lampricides every ten years with these agencies to ensure that the control program remains current with changing environmental and human health safety standards. Every lamprey-infested river and tributary requires regular lampricide treatment, usually every three to five years. Federal control agents from the Fisheries and Oceans Canada and the United States Fish and Wildlife Service spend days performing a thorough treatment of the tributaries. The video above follows 57 Sea Lamprey Control Program agents as they treat the Rifle River near West Branch, Michigan. Over the course the 8-day lampricide treatment, these agents display their commitment and endurance to sea lamprey control and the health of the $7 billion Great Lakes fishery. For more information, click on the hyperlinks within the text.